Bhutan is a land of myths and legends that are alive today in the culture and traditions that have been retained for many centuries. 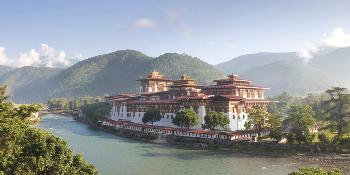 You can explore remote monasteries, spiritual temples and amazing landscapes. Aside from the mountainous north, the south of the country is a mix of forest and lowland scrub, where a variety of wildlife can be seen, especially primates, cats and other mammals, and a rich array of birdlife. For this reason it attracts visitors who enjoy exploring the natural environment on foot or by bicycle in a country largely devoid of the trappings of tourism. An amazing insight in to this land of traditions, mystery and beauty. all woven in to one. Visit the capital city of Thimphu, as well as Punakha and Paro, an eclectic mix of Buddhist influences against a backdrop of Himalayan mountain scenery.